This is part eight the last of the first booklet of my Jedi parody. 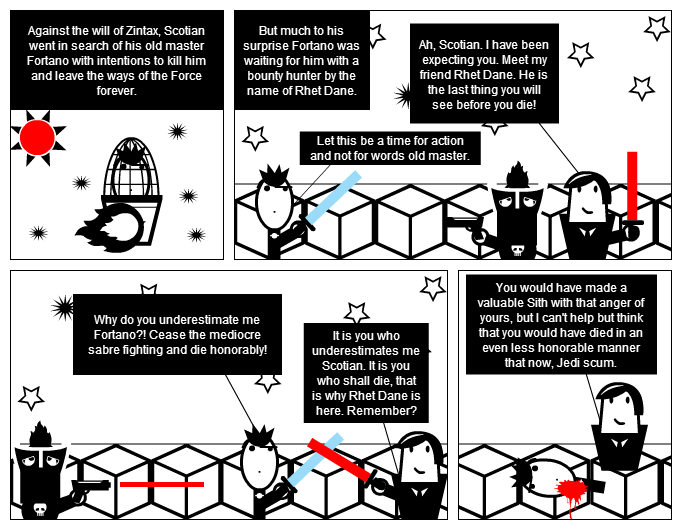 Against the will of Zintax, Scotian went in search of his old master Fortano with intentions to kill him and leave the ways of the Force forever. But much to his surprise Fortano was waiting for him with a bounty hunter by the name of Rhet Dane. Ah, Scotian. I have been expecting you. Meet my friend Rhet Dane. He is the last thing you will see before you die! Let this be a time for action and not for words old master. Why do you underestimate me Fortano?! Cease the mediocre sabre fighting and die honorably! It is you who underestimates me Scotian. It is you who shall die, that is why Rhet Dane is here. Remember? You would have made a valuable Sith with that anger of yours, but I can't help but think that you would have died in an even less honorable manner that now, Jedi scum. That's going to be sore in the morning. I must admit. That! is some good story you brought here.